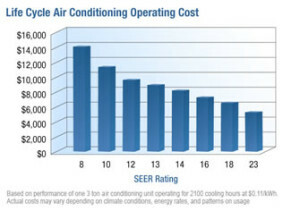 Every air conditioning unit is assigned an efficiency rating known as its “seasonal energy efficiency ratio” (SEER). The SEER is defined as the total cooling output provided by the unit during its normal annual usage period divided by its total energy input during the same period. The Higher the SEER ratings mean greater efficiency. The performance of your cooling and heating system is determined in a large part by your HVAC equipment’s operating efficiency. Each “matched system” has a outdoor compressor bearing unit that matches with an indoor unit. This is tested and then awarded an Energy Efficiency Rating, sort of like a miles per gallon (mpg) rating for your car. The more cooling/heating a system puts out for each unit of energy it consumes, the higher rating it will receive. The higher the efficiency rating of your system, the less energy it will consume in result means lower utility bills and less of an impact on the environment. Also, in some cases utility companies will often compensate homeowners to the tune of hundreds of dollars to install high-efficiency systems. Today’s ENERGY STAR qualified central air conditioners use up to 20 percent less energy than standard new central air conditioners. The ENERGY STAR specification for central air conditioners requires that the Energy Guide SEER rating be 12.0 or greater for a single-package unit and 13.0 or greater for a split system. Say you’re a homeowner in Florida who installs an 16 SEER system can save $2,070 in operating costs over the lifespan of their system and will prevent nearly 30,000 pounds of Green House Gases from being released into the atmosphere, the equivalent of removing 3 cars from the road each year or planting 4 acres of forest. Carbon Dioxide emissions are a big player in climate change, and energy usage is linked to CO2 emissions. 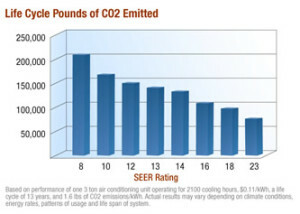 With having a High SEER air conditioner it can help with carbon dioxide emissions. The examples below show how much emissions are being released. As of January 2006, federal mandates declared that all new central air conditioning units must be at least SEER 13. AC Doctor recommends you upgrade to at least a SEER 16. This will not only save you money but also decrease CO2 emissions. 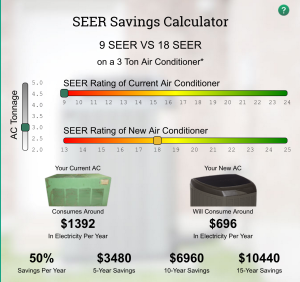 It is easy to go and search for a SEER calculator to compare how much money you are saving, for example the picture below. Installing a new system can help you save money and reduce carbon dioxide emissions. Give us a call and we will install it for you!